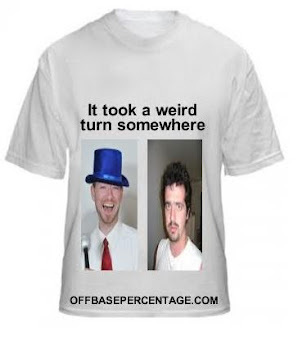 Off Base Percentage: Carlos Zambrano Is Cured Of Crazy? Zambrano said Tuesday he completed three months of anger management counseling last October, and that it's no longer an issue with him. "It's all done," he said with a grin. "I'm cured." And did the counseling work? "Yes, it did," he said. "That was an experience that I can talk (about) through the years. Maybe in the future I can be a pitching coach and speak to the young kids about what I went through, what happened in my career, things that I experienced." While this is sad news for bloggers obsessed with lunatics *high fives Canseco poster*, it's easier said than done. 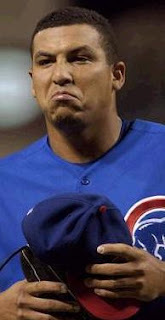 After his suspension, anger management and bullpen demotion, Zambrano returned to the Cubs' rotation and pitched 70.1 innings of 1.41 ERA baseball. So sure, he's feeling pretty good about himself right now. Give it time. As a professional skeptic, I'm not willing to believe he's cured until he pitches a two-inning, eight earned game or gets some bubble gum that doesn't chew right. I'll admit that his reaction to getting his six year opening day starter streak snapped is a positive sign for his mental health. But the crazy usually doesn't lie dormant for long, does it Milton Bradley? Now if you'll excuse me, I'm working on a Bad News Bears style screenplay featuring Zambrano as a pitching coach. The working title is You Call That a Fastball, No Wonder Your Dad Left.